This is a book for explorers. If that sounds like you, then join stand-up philosopher Tim Freke on an exhilarating journey into the “mystery experience.” Remember to wonder and become “deep awake.” Learn to think “paralogically,” beyond the limits of normal logic. Discover how we can embrace both science and spirituality. Know the “deep self.” Feel the “deep love.” Celebrate your life. The Mystery Experience presents Tim’s groundbreaking conclusions after 40 years of intensely exploring the philosophy and practice of the inner life. Refreshingly down-to-earth, profoundly funny and uncompromisingly authentic, it makes this revolutionary approach to spiritual awakening available to all. Tim has spent decades learning from the ancient Mystery school traditions. His Mystery Experience is a 21st-century expression of these ideas, based on a transformation of ancient wisdom into a radically new and immediately accessible form that also builds on the discoveries of modern science. The result is a compelling kaleidoscope of ideas, embracing, among other things, quantum physics, Gnosticism, the Tao, meditation, Walt Whitman, Greek myth, Buddhism, Jah Wobble and Carl Jung. Tim even argues points of cosmic significance with Albert Einstein – as well as debating the ancient Indian wisdom of advaita with his imaginary philosophical sparring partner, Swami Blandananda. 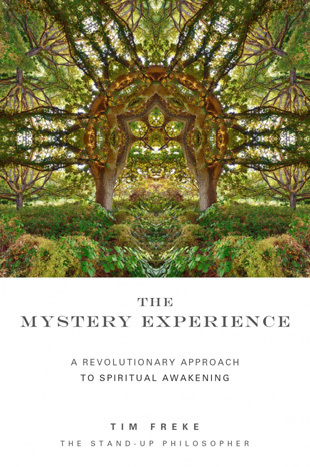 This profound and engaging book outlines the clear concepts of Tim’s radical wisdom in seven chapters: Wake up to Wonder, Enter the Mystery, Understand the Primal Paradox, Become Deep Awake, Know the Deep Self, Feel the Big Love, and, finally, Experience the WOW. In this book Tim makes it clear that anyone can transform themselves from within by becoming conscious of the breathtaking mystery of existence, which has been likened to pure bliss or limitless love. Immersion in this state of mind brings about an awe-inspiring oneness with the universe and an exhilarating passion for the adventure of life. Tim Freke has spent his life exploring the “mystery experience” and sharing it with others. He has an honors degree in philosophy and is a respected authority on world spirituality. He is the bestselling author of more than 30 books that have established his reputation as a scholar and free-thinker. He runs “mystery experience” retreats internationally, in which he guides others directly to a spiritually awakened state.